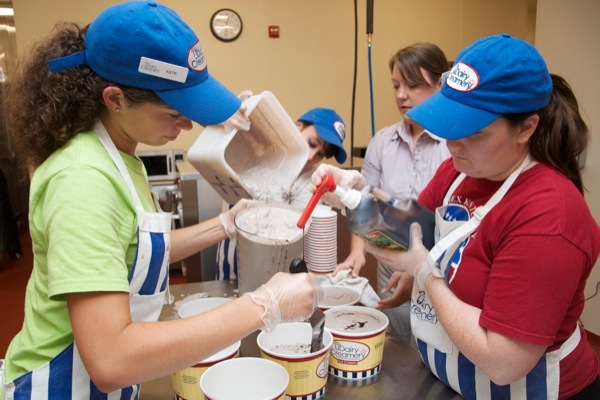 A new class offered during the University of Delaware’s Winter Session will give students an inside look at the science behind ice cream production as well as the factors involved in running a start-up business and getting ice cream from the cow to the cone. The three-credit course — The Science and Business of Ice Cream: From the Cow to the Cone — will be taught from noon-1:45 p.m., Monday through Friday, starting Monday, Jan. 12, at Townsend Hall. It will be instructed by Melinda Litvinas, UDairy Creamery manager, with guest lectures by Department of Animal and Food Sciences faculty members. Litvinas said the department has been very helpful with the implementation of the class. “This class is very collaborative with the food science faculty and they are extremely supportive of it. They’ve been really helpful and it’s going to be exciting because any student who takes it is going to get exposed not just to one professor but they’re going to meet everyone in the department,” said Litvinas. Kali Kniel, professor in the Department of Animal and Food Sciences (ANFS), said that having the class was a natural fit as the UDairy Creamery “has been successful at showing and reminding the UD community that agriculture touches our lives every day.” Kniel added that in the course “students will learn about the science and the secrets behind the creation and development of ice cream. Students may be surprised to know that the way ice crystals form during freezing is responsible for the creamy mouth feel you obtain when eating ice cream. This course will also use ice cream as a model to discuss food flavor trends and novel processing technologies. Today we all want to know more about where our food comes from, and in ‘Cow to Cone’ students will learn just that.” Dallas Hoover, professor in ANFS, said that it is important to allow UD students the chance to understand how their ice cream is made and that since ice cream making is in the realm of food science, the class is the perfect way to provide that learning opportunity. The class will involve lots of hands-on activities, such as tours of regional creameries and dairy processing facilities throughout the tri-state area. Also, students will get to spent time at the UDairy Creamery on the College of Agriculture and Natural Resourcescampus. Litvinas said the class combines both the science of making ice cream and the business of selling ice cream. “The first half is dedicated toward the science of ice cream, which also includes product development, and the students will do a big project on ice cream related product development,” said Litvinas. “We also will cover the business side and give some insight about how we run things here, and we will consider different start-up factors, such as what is involved if you want to start an ice cream business — everything from the cow to the cone.” Litvinias said that she has always wanted to offer this sort of class in order to teach more students about the UDairy Creamery, but it had been hard to find a time that worked. “We’re so busy during the spring and fall semesters that our time is not really available to allow for people to come to the creamery and work on a project. But we’re here to educate the students and we want to offer the opportunity to those who aren’t interns or employees to let them see what’s going on here and learn from it. That’s why we’re here in the first place, so people can learn how to make ice cream,” said Litvinas. Jennifer Rodammer, supervisor at the UDairy Creamery, will also be helping with the class, doing hands-on work at the facility with product development and projects. Rodammer will also talk about the Moo Mobile ice cream truck and the business aspects of it. “Our goal the last three years really has been to incorporate the creamery more into the curriculum and more into the student awareness,” she said. “It’s been a challenge to find the time to do it so we’re very excited to be able make use of Winter Session to incorporate it.” The class is open to all UD students and will be capped at 30. Article by Adam Thomas Photo by Danielle Quigley This article can also be viewed on UDaily.